Another crazy week is over for the inhabitants of the Duck and Cherry. Let me see. What was crazy about last week? Maybe when I drove Arnfinn to an early train and got a flat tire. I carefully drove to the nearest car repair shop up the street only to find that they didn't open for another hour. Problem was - it was freezing cold and I was in my pyjamas! The pyjamas were pretty and decent - but let's face it, they were after all pyjamas - not appropriate for shopping our visiting car repair shops and not very warm either. I finally gave in after standing in the cold for the longest time and asked a friend to come and get me, then called the repair shop when they opened to tell them why my car was outside their shop and where I had hidden the key. It took hours getting it fixed as I had to call around to find someone who had Goodyear tires in stock, so that I did not have to wait 5-6 days to get it replaced. How is this a happy story after all? Playing the pyjama game was pretty funny, but what I kept thinking was how grateful I was that this did not happen on the freeway - at night - all alone - etc. etc. Even half wasted days when you don't get through your to-do list can be blessings in disguise. Christmas stress creates traffic chaos, accidents, people getting frustrated in lines at the store, tension builds up because of all we should do - having to bake seven kinds of cookies (Norwegian tradition), clean the whole house (also tradition), Christmas cards, gifts and so on. I would like to have Christmas joy instead of stress. Think I'll do some planning today and see what is really important and what is not. How can I choose the good part? What is most valuable and precious within the short time frame I have been allotted? What makes sense to spend time on this Christmas month? My thoughts go to a scriptural passage in the New Testament about two women. 38 ¶Now it came to pass, as they went, that he entered into a certain village: and a certain woman named aMartha received him into her house. 42 But one thing is needful: and Mary hath achosen that good part, which shall not be taken away from her. 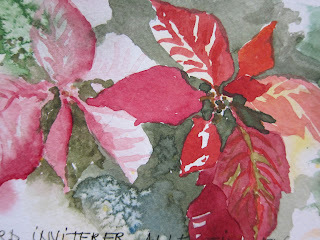 Today's water color is a detail from a picture of pointsettas. Føler nå mer enn noen gang hvor viktig det er. Takk for at jeg kan ringe deg.